Cohort one and cohort two pose together at the beginning of fall 2016. Photo by Luis Garcia. 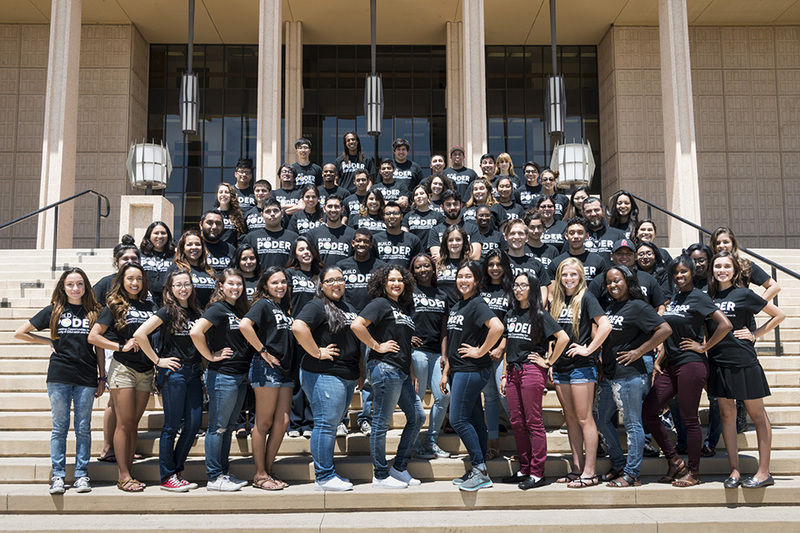 BUILD PODER's second cohort, which was much larger than the first cohort, expanded BUILD PODER by 57 students. Photo by David J. Hawkins. 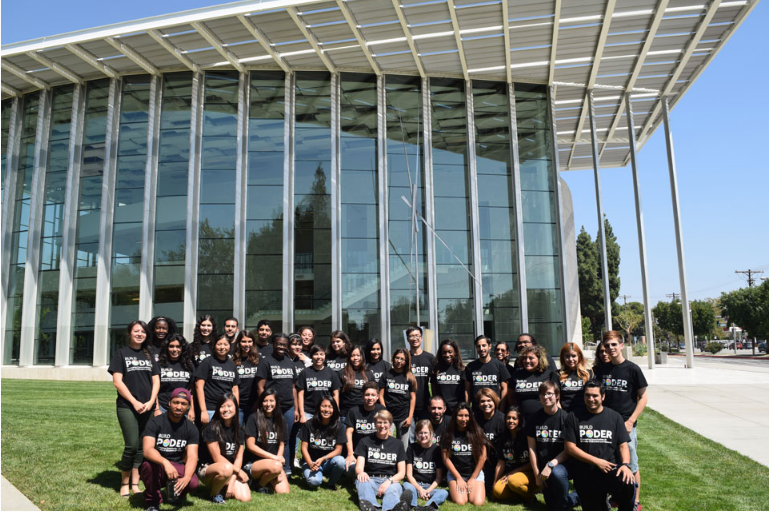 BUILD PODER's first cohort was just over fifty people — 38 CSUN students and 16 students from community college. Photo by Vanessa Cisneros. In 2014, California State University, Northridge professors of psychology Gabriela Chavira and Carrie Saetermoe spent many hours in Sierra Hall writing a proposal for a $22 million grant from the National Institutes of Health (NIH). Their hard work paid off and CSUN became one of 10 sites across the nation that host the NIH’s experimental diversity research program, BUILD — Building Infrastructure Leading to Diversity. BUILD aims to increase the number of traditionally underrepresented students in the biomedical fields, by training undergraduates in biomedical research and providing financial support. CSUN’s program is called BUILD PODER, with the second word standing for Promoting Opportunities for Diversity in Education and Research. BUILD PODER focuses on promoting health equity, as disparities in health exist between underrepresented communities and more privileged communities. A primary focus of Chavira and Saetermoe’s grant proposal was social justice and critical race theory — a theoretical perspective that studies race and racial inequities in society. The professors chose critical race theory as the basis of the program because they wanted to do something unique beyond just increasing opportunities for research. Instead of seeing underrepresented students as lacking in certain qualities, the critical race theory outlook values their native knowledge and experiences. The program uses students’ existing strengths and teaches them more skills to cope with racism, especially unintentional or indirect forms of racism that many people of color face called microaggressions. The first year of the program, BUILD PODER accepted just over 50 students. With the third cohort starting in fall 2017, BUILD PODER will support more than 150 students. Once accepted into the program, BUILD PODER students are paired with faculty mentors in their field of interest and work alongside those mentors throughout the academic year. Saetermoe said that in order to be a BUILD PODER mentor, faculty must go through a series of workshops — including training on critical race theory and cultural competency — to learn how to be better mentors to their students. BUILD PODER scholar Sarai Aguirre said the program’s unique intersection of social justice and research helped her find her calling in life. Aguirre grew up in East Los Angeles and saw many of her friends fall into depression or commit suicide from living in a consistently violent environment. As a child of teen parents, Aguirre was inspired and motivated by her circumstances, rather than hindered by them. She went to East Los Angeles Community College, one of the program’s community college partner schools, where she became a BUILD PODER trainee in 2015. She transferred to CSUN last year after completing a BUILD PODER-sponsored summer program called Summer Jumpstart. Aguirre said that even just being a successful professional as a person of color can have a positive effect on others. Aguirre won the California State University’s Sally Casanova Scholarship this month to further fund her research into neighborhood and family characteristics, and how those factors impact mental health and delinquency in ethnic minority youth. BUILD PODER students are diverse in more than just one sense. Students are also diverse in their choice of majors, their religions, their ages and their experiences. Scholar Elizabeth Sanchez, a psychology major and transfer student from Pierce College, is considered a “nontraditional” college student. In addition to studying as an undergraduate, she’s a mother of two, a wife and a researcher — and Sanchez runs her own nonprofit organization called A Work in Progress. Originally a recovery home in the San Fernando Valley, her organization now helps women recovering from substance abuse as well as mental health concerns. She added a second sober-living home to A Work in Progress in November 2016. Sanchez said that her journey through college has been long and tumultuous, but BUILD PODER has helped her navigate those many obstacles. Research shows that institutional barriers are one of the biggest reasons why students of color are underrepresented in higher education. By opening up pipelines from community colleges to CSUN, as well as those leading to graduate programs, BUILD PODER helps close the “opportunity gap” between underrepresented students and more privileged students, a problem in higher education that the CSU is trying to eliminate. 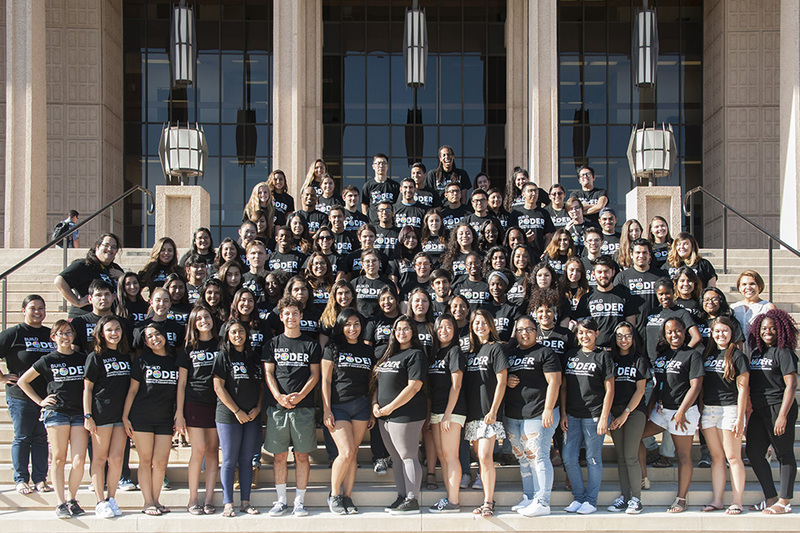 BUILD PODER partners with four community colleges — East Los Angeles College, Los Angeles Valley College, Pasadena City College and Los Angeles Pierce College. Their research partners include five local, doctoral-granting institutions (Claremont Graduate University, UC Irvine, UCLA, UC San Diego and UC Santa Barbara). This pipeline allowed Sanchez to get where she is today. As a transfer student, Sanchez was worried about her transition to CSUN, but said that participating in BUILD PODER made the transition smooth. Calvin Apodaca, a biology major, applied to BUILD PODER in 2015 and was accepted as part of the first cohort. He had enrolled at CSUN as a cinema and television arts major in hopes of becoming a director, but decided to change his career path after having a life-changing experience. It was 2011, and at the age of 18, Apodaca was diagnosed with cancer in his lower abdomen. After removing the lump, doctors told Apodaca they would have to remove lymph nodes, where the lower abdominal cancer had metastasized. Within one month of those surgeries, Apodaca was also diagnosed with acute lymphoblastic lymphoma — a type of cancer affecting the immune system. Apodaca struggled with the healthcare system while spending two years in the hospital — particularly accessing his own healthcare data, he said. This personal challenge opened his eyes to the problems within the U.S. system, where there is no widespread, standardized system to manage and share patient data. Apodaca decided he wanted to do something about it. After being in and out of the hospital for chemotherapy every couple of months, Apodaca has been in remission for more than two years and graduated with his bachelor’s degree in biology earlier this year. In 2016, Apodaca participated in a prestigious summer research program at his dream school, University of Washington. Apodaca credits much of his success to BUILD PODER and said he is proud to be a Matador pursuing a Ph.D. in biomedical and health informatics at the University of Washington, starting this fall. For more information about BUILD PODER or to apply, visit www.csun.edu/build-poder.